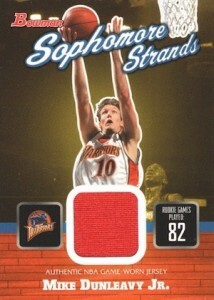 Officially marketed as 2003-04 Bowman Rookies and Stars, 2003-04 Bowman Basketball is actually two established brands in one. 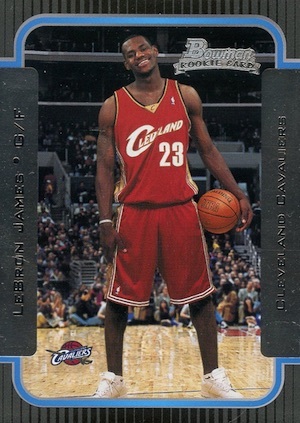 The base Bowman set can be found alongside Bowman Chrome cards in packs that offer two different options for top rookies like LeBron James, Dwyane Wade and Carmelo Anthony. Normally an uncommon practice among basketball products to feature two different lines in the same release, it will likely come as a shock to some collectors that 2003-04 Bowman Chrome Basketball is not a standalone product. Built around the base Bowman cards, there are a total of 156 cards in the main set and this group can be broken down into three main subsets. 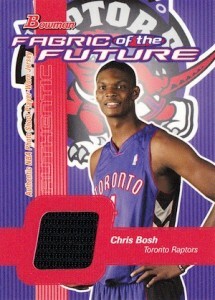 The first 110 cards are part of the traditional base set and only include veterans. 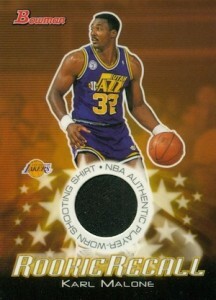 The next 36 cards (#111-146) are base rookie cards. 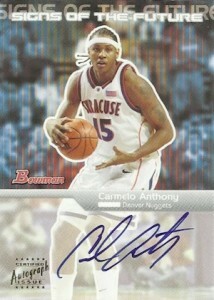 This group features the rookie cards for LeBron James and Carmelo Anthony. There is no card in spot #147. Finally, autographed rookies fill the remaining slots. 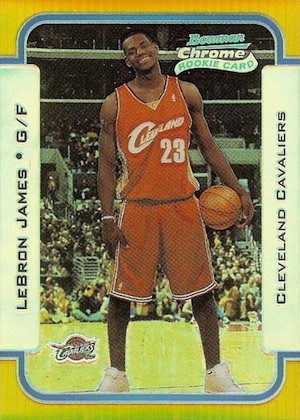 Although there are ten cards in this subset, the final card (#157) is only found among the Chrome parallels. 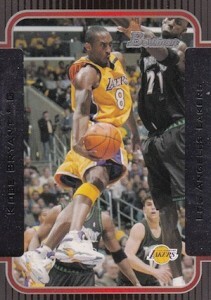 Given the Chrome inclusion, parallels are a huge part of 2003-04 Bowman Basketball. The base Bowman set does have one regular Gold parallel that averages one per pack. 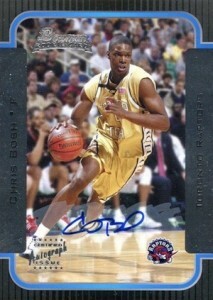 It is important to note that the Gold parallels are not signed for the autographed rookie card portion. Chrome occupies the rest of the spots and the cards are virtually identical except for the chromium technology and updated logo. While they meet all the criteria of a parallel and are found in the same packs as the base Bowman, collectors still recognize Bowman Chrome cards as official rookies. 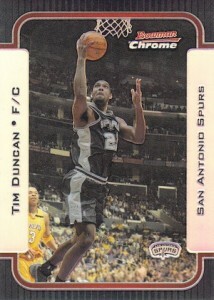 2003-04 Bowman Chrome Basketball parallels are available for each of the veterans and rookie cards and are joined by Refractor (#/300), X-Fractor (#/150) and Gold Refractor (#/50) parallels. 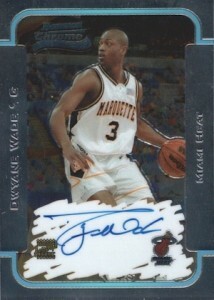 The Rookie Autographs are a bit more limited with the base Chrome parallel numbered to 250. Refractor (#/50), X-Fractor (#/25) options can also be found. All of the Chrome parallels are also signed for the final ten cards. Although Chrome is a huge component of 2003-04 Bowman Basketball, there are no inserts from the shiny brand. The only other options for collectors come in the form of relic and autograph inserts under the base Bowman name. 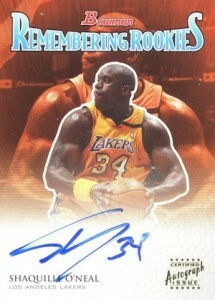 Most notable, Remembering Rookies Autographs includes hard-signed autographs for Shaquille O'Neal and Signs of the Future features on-card signatures for Carmelo Anthony, Chris Bosh and Dwyane Wade. 36 cards. No card #147. *Card 157 only available as Chrome parallel.